The advancing Internet of Things revolution is ushering in a wave of smart cities, structures, and systems, with photonics technology at the forefront. Futuristic smart cities are having their day, with numerous announcements in the past year of plans to begin developing high-tech urban endeavors all over the globe. Developers have revealed ambitious plans for smart cities in the U.S., Canada, Europe, Russia, India, Africa, and the Middle East, partly as a solution to overcrowding in rapidly growing urban centers. The definition of a smart city is somewhat ambiguous, but the main thrust of these cutting-edge municipalities is integration of the most advanced intelligent systems, data collection technologies, and information analysis methods into appealing, human-centric civic centers that usher in the progressing Fourth Industrial Revolution, the Internet of Things (IoT). Visionaries see smart cities as an attempt to combine utopian living with the best that technology has to offer: power and energy conservation, ecologically conscious transport, sustainable water and waste management systems, and green buildings with fiber optic communications and intelligent lighting, sensing, and security systems (Figure 1)1. Figure 1. Smart cities, including the Rublyovo-Arkhangelskoye district west of Moscow, will feature smarter energy structures that optimize the use of local sustainable sources such as hydro, geothermal, wind, and solar. Courtesy of Zaha Hadid Architects/Flying Architecture. Existing photonics technology will play a huge role in the design of these greener cities, from optical networks and chip-scale photonic sensors to lasers, lidar and LEDs, and solar technology. Automated smart lighting will be central to all smart-city designs, as it will optimize the mood, productivity, and sleep patterns of residents. Power-conservative LEDs will enable energy-efficient vertical farming. Incubator companies located in the smart cities will foster and grow new ideas such as these to create the next generation of photonics technologies. In November, cryptocurrency millionaire Jeffrey Berns, CEO of Blockchains LLC, acquired 68,000 acres of land east of Reno in northern Nevada, announcing plans to build a sprawling smart city called Innovation Park on the land (Figure 2). At the spine of his smart-city concept is a blockchain platform, a decentralized ledger of digital records that chronologically tracks and stores transactions such as banking and voting without ties to any government or authority. Invented in 2008 as a way to publicly track bitcoin transactions, a blockchain database facilitates and stores encrypted private transactions of digital cryptocurrencies such as bitcoin and ether without paying middlemen, companies, or banks. The goal of cryptocurrency management is a ubiquitous global marketplace with secure, hack-proof transactions of stable currency values not based on any government. Figure 2. A rendering of Innovation Park in northern Nevada. The city may pioneer uses of blockchain infrastructure as the basis for a business and residential community. Courtesy of Erlich Yanai Rhee Chaney Architects and Tom Wiscombe Architecture. Berns plans to anchor the community with a first-of-its-kind 1000-acre, high-tech R&D incubator campus that will develop technology solutions integrating artificial intelligence, nanotechnology, and 3D printing with blockchain technology. Residential units will house thousands of inhabitants in a human-centric community incorporating both workplace and manufacturing capabilities. Sustainable and efficient energy are part of the ambitious vision; Innovation Park will incorporate regenerative, renewable energy sources such as solar and wind power, and reclaimed and recycled water. The project design also includes autonomous all-electric vehicles that will drive in and out of the buildings to act as a source of circulation in the future city. “The goal of this collaboration is to create technology solutions that will produce customer-centric energy platforms powered by public blockchain,” Berns said, “all with the intent of integrating approved incubations into Nevada’s energy framework.” Berns expects construction to begin in 2019. In addition to Innovation Park, other smart cities announced this year include Belmont, Ariz., near Phoenix, initiated by billionaire Bill Gates, and another on the Toronto waterfront to be built by Google’s sister company Sidewalk Labs. Further smart-city projects in Las Vegas, Portland, Ore., and Kansas City, Mo., are rolling out a variety of initiatives, public safety programs, and IoT efforts, while searching for the necessary funding to carry out the longer-term plans. The ambitious smart designs are all variations on a theme. The Saudi Arabian government has invested £382 billion ($414 billion) in a smart city that will be completely automated by robots. In Russia, the firms Zaha Hadid Architects and Pride Architects have announced a people-centric sustainable smart city west of Moscow with design driven by studies about what makes people happy. The people-first master plan will feature large tracts of forest, parkland, and a central lake for over 66,500 residents, who will be able to participate in the evolution of the community and interact via innovative smart technologies. Much like companies grow and evolve in response to customer demand, smart-city agencies will mine citizens’ expectations and analytics to more effectively improve city services (Figure 3). Figure 3. A rendering of the Rublyovo-Arkhangelskoye smart city, which could provide 800,000 sq m of office space for the booming financial, legal, and auditing industries of Moscow. Construction on a 12-mile railway line to Moscow is expected to begin in 2020. Courtesy of Zaha Hadid Architects/Flying Architecture. Photonics sensors will be incorporated in numerous ways; the possibilities are endless. Thermal image sensor designer and manufacturer ULIS (Grenoble, France) announced in October the launch of a new thermal-building sensor line dedicated for use in smart buildings. The ThermEye-b90 and -b120 offer a 90° or 120° field of view via an 80- × 80-pixel amorphous silicon microbolometer array, which can be incorporated in people-counting equipment to localize, image, and sense the human presence in connected buildings (Figure 4). Thermal imaging in the longwave IR (LWIR) range enables sensing of people even when they are immobile, and can distinguish people from pets without violating privacy. This type of sensor can help facilities optimize space management and occupancy rates, regulate temperature and energy via HVAC (heating, ventilation, and air conditioning) and lighting systems, detect potential fire hot spots, and manage the flow of people during emergencies. The high cost of photonics sensors has typically been a trade-off for higher resolution and performance over electronic sensors, but low-cost mass production has made photonics sensors such as ThermEye inexpensive and increasingly attractive in smart-building applications. Figure 4. The ThermEye-b120 building sensor is a new microbolometer-based sensor array for localizing and counting people using smart-building applications to better use space and manage energy. Courtesy of ULIS. Another type of photonics sensor reduces the cost of monitoring structural integrity, using the fluorescence of carbon nanotubes in a spray-on film. Professor of chemistry Bruce Weisman at Rice University in Houston was working with single-walled CNTs (carbon nanotubes) that fluoresce upon exposure to red diode laser light. Weisman’s group captured the spectra of the CNTs using shortwave IR (SWIR) detectors as they were strained or deformed under stress. Weisman’s colleague, professor of civil and environmental engineering Satish Nagarajaiah, recognized the potential of the CNTs as a new method to measure strain. Their collaboration resulted in a large-scale strain measurement method whereby manufacturers of, say, bridges or aircraft wings could spray a surface with a thin, uniform layer of CNTs, which could act as a sensing smart film so thin it’s called a smart skin2. “Wherever you point the laser, you will get emission that reveals the strain at that point,” Weisman said. This type of noncontact strain mapping has many advantages over current legacy strain-sensing technology, in which numerous electrical foil strain gauges are applied to a surface and connected to a sensor device with wires. The strain gauges are limited to measuring strain at the measurement points, whereas the smart-film method presents a huge number of strain sensors in the form of the CNTs embedded in the film (Figure 5). Figure 5. Smart-film noncontact strain mapping uses carbon nanotubes applied in a transparent thin film on a surface to reveal spectroscopic changes in fluorescence when the surface is under stress. The acquired strain map (a) shows that the smart ‘skin’ on a surface can effectively assess and monitor stress and strain over time via spectroscopy; the results are comparable to the spatial strain simulated with finite element analysis models (b) using strain gauges placed at points labeled p and g. Courtesy of Satish Nagarajaiah Group/Weisman Research Group/Rice University. “The CNT smart skin is transparent, so could go over all kinds of surfaces,” Weisman said. “It’s lightweight, which is ideal for aircraft. It can be used anywhere you want to prevent structural failure. And we believe it has quite a long lifetime.” Its useful place in smart structures awaits an entity interested in licensing the technology for commercialization. Researchers at the Massachusetts Institute of Technology in Cambridge, Mass., are developing another promising smart-photonics technology, especially in terms of climate change: windows that automatically modulate incoming radiation to reduce the need for cooling in smart buildings3. Professor of mechanical engineering Nick Fang and his group began a collaboration with the University of Hong Kong to help the city meet its aggressive commitment to reduce energy consumption 40 percent by 2025. In the high heat of summer, Fang said, every square meter of window in Hong Kong passes about 500 W of energy into the building — the equivalent to five 100-W light bulbs. While other technologies exist to block out sunlight when necessary (like sunglasses that tint 25 to 30 percent darker in the sun), the challenge is to do it more effectively, yet cheaply — automatically and without consuming power. To find a solution that could turn such wasted energy into a way to block heat without blocking too much light, Fang’s group scoured the literature to identify thermochromic materials — those that change phase or color in response to heat. They settled on hydrogel microparticles of poly (N-isopropylacrylamide)-2-aminoethyl methacrylate hydrochloride (shortened to the marginally more concise nickname pNIPAm-AEMA), tiny spheres that shrink at hot temperatures above 85 °F (29 °C), shedding water and contracting so they reject light. In previous microgel smart-window designs, the particles blocked some light, but they shrank too much, allowing the IR light and heat to pass through the gel. The researchers therefore tailored the microparticles, adding a molecular group onto the hydrogel to expand the particle size to about 500 nm — just enough to block IR sunlight at low temperatures. When they applied the particles to a film on a 12- × 12-in. glass window, the researchers found that the particles reflected 70 percent of the incident thermal radiation at ambient temperatures of 77 to 95 °F (25 to 35 °C), which would make a 9 °F (5 °C) difference in a room. The smart windows effectively blocked all thermal light at temperatures of around (90 °F) 32 °C, causing the windows to become translucent, but they returned to transparency when cool. The windows could be manufactured easily and cost-effectively in volume. Figure 6. At warm temperatures, demonstrated in a handprint on a cold day, smart windows coated with a thin film of tailored hydrogel microparticles automatically change their internal structure and reject IR light and heat in order to cool the room, reducing the energy required to cool buildings. Courtesy of X. Li/MIT. “In the current design, you won’t have a perfect ocean view,” Fang said. “But we plan to develop a solution that will absorb the IR at the right time without becoming opaque.” Testing will occur in Hong Kong, with its numerous windows in skyscrapers, high-speed trains, and buses (Figure 6). Not only does the work apply to smart structures, it may also be broadly applicable to displays, optical modulators, and even invisibility cloaking. 1. J. Smalley et al. (2016). 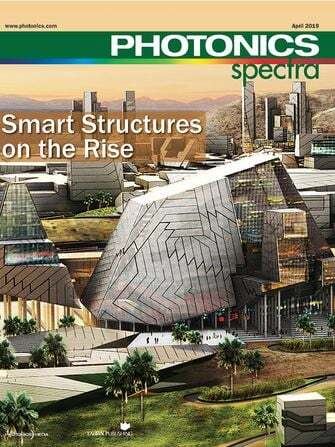 “Photonics for Smart Cities,” in Smart Cities Technologies, I. Da Silva and R. Flauzino, eds. IntechOpen, Open Access web, https://doi.org/10.5772/64731. 2. P. Sun et al. (Jan. 2019). Dual-layer nanotube-based smart skin for enhanced noncontact strain sensing. Struct Control Health Monit, Vol. 26, Issue 1, https://doi.org/10.1002/stc.2279. 3. X-H Li et al. (Oct. 2018). Broadband light management with thermochromic hydrogel microparticles for smart windows. Joule, Vol. 3, Issue 1, pp. 290-302, https://doi.org/10.1016/j.joule.2018.10.019. Structural surfaces that incorporate an embedded sensor network capable of detecting flaws within the structure.